With its latest invasion-by-proxy in Chad, the Sudanese government is taking its defiance of the United Nations Security Council to a new level. As we speak, Khartoum is sponsoring and supporting an open and transparent effort to overthrow a neighboring government. A month ago, the regime burned the strategic town of Abyei to the ground, leaving the North-South Comprehensive Peace Agreement (CPA) at extreme risk. This comes against the backdrop of a government offensive in Darfur and ongoing support to the Lord’s Resistance Army (LRA), whose actions threaten the children of four countries. In response, the Security Council has passed 9 resolutions and issued 19 presidential statements on Sudan since Darfur’s war began in 2003. But the crisis in Darfur is only escalating, and the CPA is at risk of collapse in the coming year. The lack of an effective response to Darfur is putting the credibility of the Security Council on the line for future efforts at peacemaking and peacekeeping around the globe. Not imposing consequences for such destruction and obstruction emboldens Khartoum to continue to undermine the security of Sudan and the surrounding region, and encourages other rogue regimes globally to defy the Council’s will. The rebels have also contributed to Darfur’s insecurity, partly because of the lack of Security Council consequences. The role of the UN Security Council is clear. By imposing consequences, you can provide the leverage – the pressures and incentives – that will provide influence for the mediators, the ICC and UNAMID to do their jobs effectively. In the absence of such leverage, and if you pass more resolutions that don’t create real consequences for non-compliance, Sudan will continue to burn. While my colleagues have spoken about accountability, civilian protection and humanitarian imperatives in Darfur, I would like to focus on the need for a diplomatic surge focused both on creating an effective peace process in Darfur and pressing for implementation of the CPA. In pursuing peace in Darfur, the Security Council must simultaneously drive efforts to secure a deal for Darfur and to implement the CPA, while building the leverage to help achieve a peaceful Sudan. To prevent the further deterioration of this volatile situation, the U.N. Security Council must take immediate steps to lead in launching and sustaining an effective peace process for Darfur. In the absence of some kind of more robust action from the Council, the process threatens to drift interminably without a strategic direction and without the kind of mediation structure that would give peace a chance. The Security Council should immediately appoint a single, empowered mediator: One strong lead mediator must replace the current structure of dual AU and UN special envoys. A single mediator is necessary, because a diffusion of responsibility leads inevitably to a diffusion of effectiveness. The mediator must be fully supported to drive an ongoing process and must be supported by a full-time peace secretariat with expertise in all of the relevant issues under negotiation. The process leading to the CPA—led by a single, empowered Kenyan mediator—provides a crucial model for success. The mediator must deal equally with the Sudan-Chad proxy war, as well as closely coordinate with those working for the implementation of the CPA. The Security Council should support that mediator with coordinated international leverage: The process that led to the CPA was backed by a “Troika” of countries (the UK, U.S., and Norway, with many others participating in supportive roles) providing coordinated international leverage. Peace efforts in Darfur require the same kind of organized structure. The P-5 all have significant points of leverage in Sudan. The P-5, or some subset thereof, should designate full-time diplomats and deploy them in support of the mediator, just as the “Troika” did in pursuit of the CPA. They would focus on backing up the mediator and neighboring states with clear and focused incentives for and pressures on all key actors to achieve a peace deal for Darfur, implement the CPA, support the ICC, and deploy UNAMID. For over a year, the Security Council has known that the town of Abyei was a flashpoint with the potential to detonate the entire CPA. The worst fears were realized last month when Brigade 31 of the Sudanese Armed Forces displaced the entire civilian population of Abyei and burned its market and housing to the ground. This was predicted and preventable. Because the mechanisms for oversight of the CPA did not function and the Sudanese government refused to implement the recommendations of the Abyei Boundary Commission despite its commitment to do so in the CPA, the Security Council must become much more involved in making sure this damaged peace agreement does not collapse. The Security Council should ensure there is robust monitoring of the terms of the CPA, and sanction non-compliance. If there is no consequence for non-implementation of the CPA’s many provisions, particularly the ones regarding Abyei and other flashpoints, and the agreement collapses, then war will again erupt between the ruling party and the Sudan People’s Liberation Movement. The Security Council should ensure that UNMIS has a clear presence in Abyei and is actively involved in overseeing the implementation of the CPA terms for Abyei and the recent agreement to de-escalate that area. The Council should ensure also that the UNMIS presence in Abyei town is reinforced with a permanent UN military and civilian presence to effectively monitor the situation, accurately report conditions on the ground, and promote local reconciliation. Ending the catastrophe in Darfur requires a three-pronged effort that involves international protection for civilians, accountability for human rights abuses, and a peace agreement that resolves the underlying political issues. Equal efforts must also go into ensuring the implementation of the CPA and its provisions such as national elections and the referendum for the South. The Security Council must impose meaningful consequences for individuals who impede efforts at protection, peacemaking, humanitarian access, and accountability. Without such costs, the war calculation will remain unchanged. 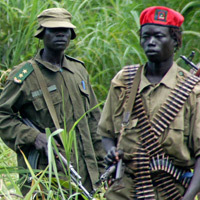 To build leverage, the Security Council should expand the list of individuals identified for targeted U.N. sanctions and impose a full arms embargo on Sudan, with an appropriate carve-out for southern Sudan if the Government of Southern Sudan continues to show good faith in implementing the CPA. A cost must be imposed on the government for its attacks upon civilian targets in Darfur (including violations of your ban on offensive military flights), its violation of the arms embargo, its refusal to implement key provisions of the CPA, its obstruction of the full deployment of UNAMID, and its failure to arrest International Criminal Court indictees Ahmed Haroun and Ali Kushayb. Absent measures to significantly alter the calculations of senior NCP officials, the situation will continue to deteriorate. The Council should impose similar sanctions against rebel officials who obstruct peace and protection initiatives and are responsible for crimes against humanity.